In August 1997, more than a hundred musicians from all over Europe were besieging the Winzer Krems stage and, besides their performances, the Kunsthalle Krems as well as the rest of the town—for one week, the musicians were occupying all the rooms of a hotel. A festival was taking place, gathering 18 bands from 17 different countries under the motto “Glatt&Verkehrt”. This first issue of “Glatt&Verkehrt” was being organized with the support of the European Broadcasting Union and thus became the basis for the close co-operation with the ORF radio program Ö1. Since 1998, the last weekend of July or the first one in August respectively has been reserved for the festival (for program details search the archive). Since 1999, a CD featuring the festival’s highlights has been produced every year. It was “discovered” during the search for suitable locations for the accordion festival in 1995: the roofed yard of the biggest Austrian winegrowing association “Winzer Krems”’s main building in the Sandgrube 13, holding some 1000 visitors and offering a marvellous view over the whole town, on the Danube and Stift Göttweig. 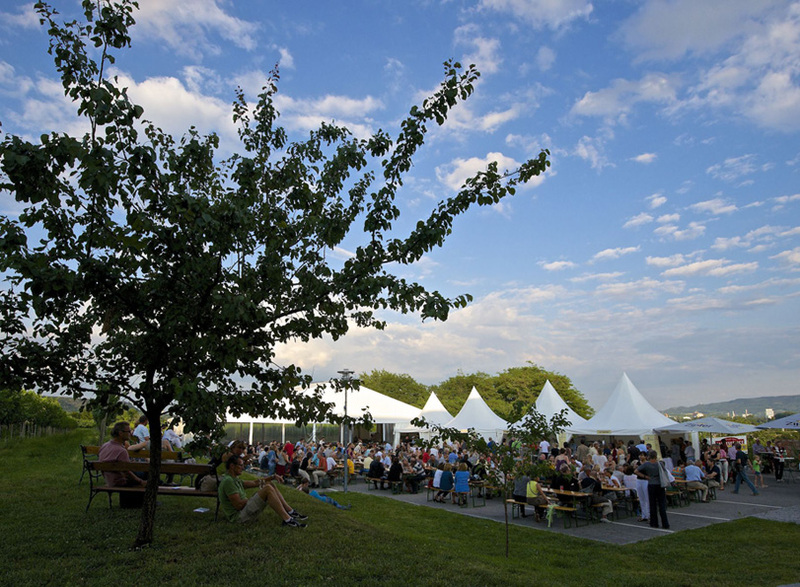 The cellars of the Winzer Krems provide for some high-quality wines to accompany the regional meals offered in the tent area of the festival. The location is thus predetermined for a long summer weekend, with music, food and drinks on the highest of levels. For one week, when the abbots of Stift Göttweig accommodate participants and instructors of the music workshop, the wonderful Benedictian monastery will be echoing from yodels, duets, czardas, or tango. With both hard work and a lot of fun, the workshop teaches pretty much everything to do with folk music. The Donauuniversität’s Centre for Contemporary Music contributes with a scientific approach to subjects being treated at the festival: Music and trance, music from Africa, music and marketing, etc. The sound room Krems Minoritenkirche is featuring contributions to the topic “Ethnical Music and Film”, partly accompanied by live music. Finally, “Glatt&Verkehrt” musicians are performing at the idyllic yard of the Spitz castle within the traditional Marillenkirtag (apricot fair). The co-operations with the ORF’s Ö1, the Weinstadtmuseum of the city of Krems, the Kunsthalle Krems, the Lower Austrian Provincial Government, and various sponsors from the past year, have led to a working collective which was later on also joined by the Österreichische Filmgalerie, the Centre for Contemporary Music at the Donauuniversität Krems, and Stift Göttweig. The main organizer and legal representative of the festival is the Niederösterreichische Festivalgesellschaft located in Krems. Three of the five festival days will offer the most diverse program possible, while the remaining two days will emphasise some special highlights: Thursday has so far been focused on topics like “Flamenco”, “Al Oud—an Arabian night”, “Portugal”, etc. Wednesday, opening day at the winegrowers, is dedicated to the native music scene: under the motto “Wachau rendezvous”, regional ensembles will be working on new projects and premiere performances.